→Best Blue Light Blocking Glasses for the Computer 2018: Check This Out! 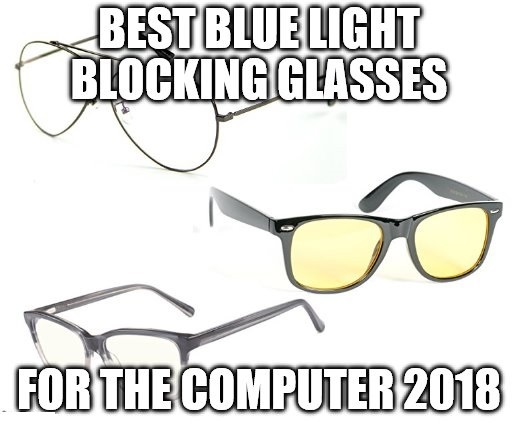 Best Blue Light Blocking Glasses for the Computer 2018: Check This Out! Are you looking for the Best Blue Light Blocking Glasses for the Computer for this year 2018? Do you suffer from computer eye strain and want to get rid of this problem? Well, I suggest that you read this article in order to learn more about the options that you have. Computer eye strain is a wide spread problem and almost everyone of us experience it. This is because of the digital devices that we are exposed to. Typically, people spend 6-8 hours a day in front of digital screens in their work place or at school. This long hours of exposure tends to promote eye related issues such as dry eyes, red eyes and eye fatigue. But then, there are already solution to this problem. This includes the computer glasses. Basically, it is an eyewear that have special tinting on the lenses that blocks the harmful blue light from reaching our eyes. I decided to make a list of the best computer glasses that you can use. I suggest that you look into each one of them in order to have the best option. 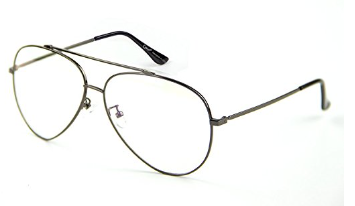 This model of Cyxus glasses is styled like aviator glasses. It brings a retro or vintage vibe to the user. In fact, being vintage is trendy as of the moment. The frame is thin all through out from the rims to the arms. Aside from being plastic, the thinness of the frame made the whole assembly lightweight. Hence, it is bearable for the key facial features to carry the glasses even during a long period of usage. Due to its flexibility, the glasses will have less potential for breakage at certain impact or pressure. Cyxus claims that the lenses block 90% of blue light. The frame is characterized by a thin and black plastic. The rims are rectangular with soft curved edges. The lenses are non-polarized, anti-reflective, and anti-blue ray; yet they remain clear without a slightly amber tint. Usually, computer glasses have a slightly amber or yellowish tint to block blue light. 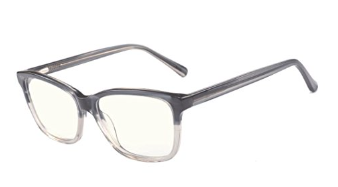 But as for this eyewear, it has a clear lenses that may be good because there would be no color distortion. R3336 Blue Lens glasses comes with a hard, oval-shaped case that has a wooden design in light brown tone. 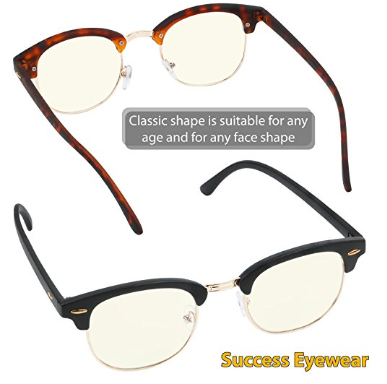 Success eyewear appears to be a half-rimmed glasses. The upper part of the rim, as well as the arms, are made of plastic. The advantage of this set of glasses is that the lenses and the frame is both made of plastic. It is expected that this eyewear is incredibly lightweight. They are also spherical in shape. They are clear but with very little tint causing the blue light that could enter the eyes to be noticeably diminished. Aside from which, the lenses are non-polarized but is claimed to be anti-glare and anti-reflective. Wayfarer is a style that never goes out of fashion. It is classic and suits many kinds of face shapes and sizes. Even though it may appear a bit oversized, it is still favored by the current trend. The frame being made up of TR90 allows it to have the general properties of a polymer, but even better. Generally, polymers are lightweight, corrosion-resistant, and elastic. The lenses are colored amber. And this feature provides the anti-blue light capacity. It only blocks 90% of high-energy blue light. Apart from the glasses, a glasses case, glasses pouch, and cleaning cloth is included in the package. The package is complete with necessary accessories to give the glasses the utmost care and protection. The glasses come with a soft cleaning cloth and a hard case. The cleaning cloth effectively wipes the stain and foreign agents without scratching the glasses’ surface. In general, polymers are lightweight, elastic, and resistant to corrosion brought by oxidation. Both materials are hypoallergenic and non-toxic. An advantage of using acetate over plastic is the vibrancy of colors and intricacy of design that the manufacturer can make. This product can be worn especially in front of radiation-emitting devices such as laptops, desktops, tablets, cellular phones, television screens, and even fluorescent lights. MIDI glasses are rectangular-rimmed eyewear. The frame is made of polycarbonate material. It is thin all throughout the glasses. The design and shape of the frame is simple, casual, and classic. Any face shape and size could relate to such universal design. What I like about this glasses is the lenses remain clear and transparent unlike other anti-blue light lenses. All glasses are shipped with soft portable pouch. Under the Prospek name, Spektrum uses a thin polycarbonate frame that has a black and yellow gem-like design. The frame employs a modified wayfarer design. The lenses follow the design of the frame. Each is slightly rounded than the classic wayfarer style. These are primarily anti-radiation glasses blocking 50% of blue light emanating from radiation-emitting devices. Aside from these two forms of radiation, the lenses still have other forms of electromagnetic radiation that could be blocked. The lenses also claim to be anti-screen flicker, anti-glare, anti-reflective, anti-scratch, anti-fog, and anti-oil (fingerprint-resistant). Prospek by Spektrum comes in a rectangular hard case that is enough to protect the glasses from foreign agents. What I like about this Fidgix computer glasses is its simple design. It is designed in a wayfarer style by which the lenses are made to be large. These lenses are tinted in pale yellow. Such tint allows the lenses to filter harmful blue light. Analyzing the ergonomics of the frame, we have the nose pads being a mere extension of the frame. It allows apt focal distance for the eyes and the lenses. Air circulation on this area is freed. Fidgix glasses only come with a hard shell case that is opened and closed by a zipper. 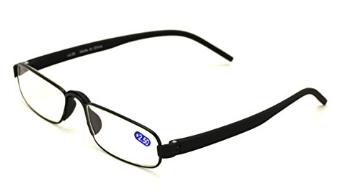 These are just some of the best blue light blocking glasses that you can use while in front of your computer or other digital devices. Personally, I prefer the Cyxus retro glasses and Kirka glasses. The tinting on their lenses is not that dark thus color distortion is minimized. Plus they are also budget friendly. Nevertheless, all of these glasses offer protection for our eyes against the harmful blue light. So it is just a matter of personal preference on which one you will choose. 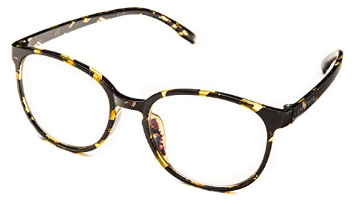 Please comment your favorite glasses below or suggest an eyewear that you want me to review. Loved your review of these glasses, and explaining all the benefits for each one. Being an active blogger and PC gamer myself, it’s very important for me to keep my eyes protected. As I am frequently on the PC and do care about my health in general 🙂 excellent job on the site thus far. I am glad that you appreciate my effort in providing information about computer glasses. By the way, which among these glasses do you prefer? Those wayfarers look pretty cool! How harmful is the blue light emitted from computer screens? I do find I get some eye strain, especially in lower light situations – also, I believe I don’t sleep the best if I’m using my laptop or streaming a show late into the night. Personally, I believe that we should prevent the harmful effects of the blue light as soon as possible. Eye strain and sleeping problems are just some of the issues that you might face so it is better to prevent it the soonest time possible.